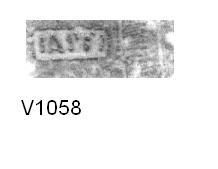 Kirklee McMunn Barr watching brief TR 1065 1 TR vessel with stamp (Shimmin 1998). Sheepen II IIc (1) TR 1B Platter 488 1 (Rigby 1985, GB58). Balkerne Lane 1973-6 D34 TN Cam 8 1 (Symonds & Wade 1999, 212, fine grey fabric and surface). Imported or TN-type. Balkerne Lane 1973-6 E1065 TN Cam 8 1 (Symonds & Wade 1999, 212, fine grey fabric and surface). TN or TN-type? Balkerne Lane 1973-6 J435 TN Cam 8 1 (Symonds & Wade 1999, 212, fig. 5.1.19). TN or TN type. Balkerne Lane 1973-6 T2 TN Cam 8 1 (Symonds & Wade 1999, 212). TN or TN-type, fig. 5.1.16. Balkerne Lane 1973-6 T342 TN Cam 8 1 (Symonds & Wade 1999, 212). TN or TN-type, fig. 5.1.14. Balkerne Lane 1973-6 T590 TN Cam 8 1 (Symonds & Wade 1999, 212). TN or TN-type, fig. 5.1.15. Balkerne Lane 1973-6 V738 TN Cam 8 1 (Symonds & Wade 1999, 212, fig. 5.1.18). TN or TN-type. Culver St 1.81 B1551 TR Cam 8 2 (Symonds & Wade 1999, fig. 5.24.25). Fine granular fabric with rough surfaces, Burnt. TR or TR-type. Culver St 1.81 B1596 TN Cam 8 1 (Symonds & Wade 1999, 212, fig.5.1.9). Culver St 1.81 G3512 TR Cam 8 3 (Symonds & Wade 1999, fig. 5.24.26). TR or TR-type. Joslin Coll Grave 44/26 TN Cam 8 1 (May 1930, pl. LXXXI.44). Lion Walk 1971-4 LWC J951 TN Cam 8 1 (Symonds & Wade 1999, fig. 5.1.17). TN or TN-type. Colchester cemetery Hull Burial 615 TR 1C Cam 56 1000 1 Burial disturbed by grave-diggers according to museum register. Culver St 1.81 E1122 TN Cam 56 1 (Symonds & Wade 1999, 217, fig. 5.4.107). TN or TN-type. Balkerne Lane 1973-6 K25 TN Cam 12 1 (Symonds & Wade 1999, fig. 5.1.21). Balkerne Lane 1973-6 V63 TN Cam 12 1 (Symonds & Wade 1999, fig.5.1.20). Sheepen II C4 II TN Cam 13 2 Mauve grey, very dark for TN. Sandy fine grained; second eg. pale grey. Sheepen II Fe 4 (2) TN Cam 13 1 Brilliant blue white sandy core. Moulded footring. Sheepen II G21 TN Cam 13 1 Pale grey-blue core, dark surfaces. Sheepen II I 26 (1) TN Cam 13 1 White sandy core, soft powdery surfaces. Very worn. Balkerne Lane 1973-6 K120 TN Cam 14 1 (Symonds & Wade 1999, fig. 5.1.31). Balkerne Lane 1973-6 P20 TN Cam 14 1 (Symonds & Wade 1999, fig. 5.1.30). Balkerne Lane 1973-6 T131 TN Cam 14 1 (Symonds & Wade 1999, fig. 5.1.25). Balkerne Lane 1973-6 T333 TN Cam 14 1 (Symonds & Wade 1999, fig. 5.1.26). Maldon Road MRC 59 TN Cam 14 1 (Symonds & Wade 1999, Fig.5.1.24). TN or TN-type. Balkerne Lane 1973-6 E778 TN Cam 16 1 (Symonds & Wade 1999, fig.5.2.60). Balkerne Lane 1973-6 K201 TN Cam 16 1 (Symonds & Wade 1999, fig. 5.2.62). Balkerne Lane 1973-6 T462 TN Cam 16 1 (Symonds & Wade 1999, fig. 5.2.56). Balkerne Lane 1973-6 T485 TN Cam 16 1 (Symonds & Wade 1999, 5.2.59). Balkerne Lane 1973-6 T70 TN Cam 16 1 (Symonds & Wade 1999, fig. 5.2.61). Lion Walk 1971-4 LWC B448 TN Cam 16 1 (Symonds & Wade 1999, fig. 5.2.57). TN or TN-type. Lion Walk 1971-4 LWC J1486 TN Cam 16 1 (Symonds & Wade 1999, fig. 5.2.58). Balkerne Lane 1973-6 E1003 TN Cam 3 1 (Symonds & Wade 1999, 212). Lexden Dyke 1932 Section 5 TN Cam 4A 1 (Hawkes 1995, 44). Balkerne Lane 1973-6 T614 TN Cam 58 2 (Symonds & Wade 1999, fig. 5.4.110). Balkerne Lane 1973-6 E1053 TN Cam 56C 1 (Symonds & Wade 1999, fig. 5.4.104). Balkerne Lane 1973-6 V78 TN Cam 7 2 (Symonds & Wade 1999, 212). Sheepen II Amphora Cam 185 (Haltern 70). Minimum 8 vessels. (Amphorae report: Sealey 1985). Sheepen II Amphora Cam 186 (Beltran I, IIa/Dressel 7-11 includes Cam. 186a/b and c) Minimum 37 vessels. Sheepen II Amphora Carrot type Cam 189. Minimum 7 vessels. Sheepen II Amphora Dressel 1 sp Minimum 5 vessels. Sheepen II Amphora Dressel 2-4 Minimum 44 vessels. Sheepen II Amphora Dressel 20 Minimum 21 vessels. Sheepen II Amphora Gallic Dressel 28. Minimum 5 vessels. Sheepen II Amphora Richborough 527 Minimum 1 vessel. Sheepen II Coins Numerous Belgic and Roman coins listed on fiche (Niblett 1985). Sheepen II Mortaria Miscellaneous Petrology suggests source from Eifel/ Rhine region (Williams 1985, 93).